Opera Software rolled up updates to both Opera Mobile and Opera Mini today. Opera Mini 6.5, which was released for Android 3 weeks ago, is now available for Java ME, Symbian 2nd edition and latter, Apple iOS and BlackBerry OS 4.2.1 and latter. Opera Mobile 11.5, which also first appeared on Android three weeks ago, was released today for Symbian 3rd edition FP1 and latter. There are a bunch of new features in both browsers. Opera is emphasizing the Data Usage View (image above, right), a new page that shows how much data Opera Mini has consumed and how much was saved by Opera’s server size compression and optimization. Another big change that many users have been clamoring for on the Opera Mini Forums is that the Java and BlackBerry versions of Opera Mini 6.5 can open saved pages created by previous versions. Up to now, most new Opera Releases were unable to open pages saved with prior versions. Opera didn’t say which older version’s pages 6.5 can read. The saved page feature was introduced with Opera Mini 4.1 in 2008. I’d be surprised if the new compatibility goes back that far, but hopefully it supports at least Mini 6.0, which came out in March of this year. Another notable change is that users can override Opera Mini’s choice of using the socket and HTTP connection protocols on the Java and BlackBerry platforms. Opera Mini 6.1 introduced completely automatic protocol selection, which did not work on some networks. This release reverts to allowing manual protocol overides. 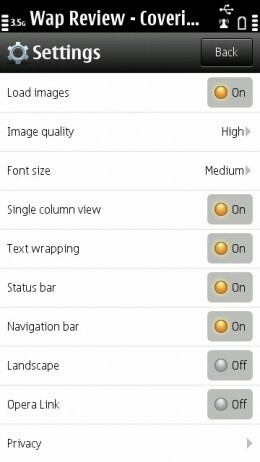 The Symbian version of Opera Mini 6.5 has a new option settings option (image below, left) to enable display of the Symbian status bar at the top of the screen. The status bar (image top, left) displays the signal strength, battery state, notifications and in Symbian Belle, the current time. 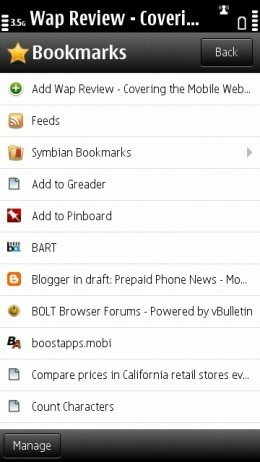 Also new in the Symbian release of Mini is the ability to use amd import bookmarks from the native browser (image below, right). 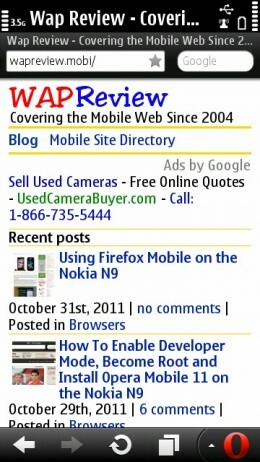 Like Mini, Mobile 11.5 gets the new Data Usage View and support for viewing the Symbian Status and Notification bar. Opera Mobile’s rendering engine has been updated to 2.9.201 in 11.5. It adds support for ECMAScript 5.1, including strict mode, HTML5 microdata, the CSS 2.1 display:list-item attribute and performance and memory optimizations. This entry was posted in Browsers and tagged BlackBerry, iOS, Java ME, Opera Mini, Opera Mobi, Symbian by Dennis Bournique. Bookmark the permalink. I use the Opera Mini on Blackberry Bold 9650, but it sometimes takes so long to load a page. The only plus is the many features. My brother uses it with the new BB 9330 and he says it works just fine, so i might just need to upgrade to the 9330. What a about a review of om 4.4 for those of us still using “dumb” phones? It wouldn’t be much of a review. There are no visible changes in 4.4 compared with 4.3. According to Opera the difference is that network code has been redesigned which “opens up new possibilities for your network operator to integrate services like free Opera Mini browsing to certain sites”. I’ve not heard of any operator using this feature, though. Very true. Symbian^1 phones have too little RAM to run Opera Mini well. It needs at least 60 MB free, more if you want to be able to open multiple tabs.